Once lakes are covered with ice, Dakota Prairie Angling shifts it's attention back to Northeastern South Dakota Lakes. 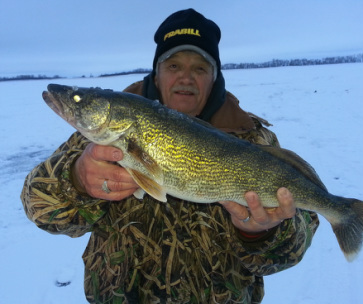 South Dakota is known for it's HOT summer walleye fishing but it's widely known winter perch and walleye bite can be just as HOT! Again, we want to keep you on top of the fish and work hard to do just that. During the winter, there is no weather that stops us. We have fully equipped Polaris Rangers loaded with the latest Frabill ice fishing equipment that will transport you to the fishing hotspots. Heated portable Frabill shelters will protect you from the elements. Using the latest in equipment allows us to stay "mobile" and concentrate on these schools of winter roaming fish! Humminbird electronics teamed with the Frabill Ice-Hunter Rod Combos are our arsenal of choice in icing Dakota walleyes and JUMBO perch. Don't let the thought of cold weather deter you from a great South Dakota fishing trip. We strive to keep you warm and SAFE. We are eager to share a great South Dakota Ice adventure with you! Guide Marlo with a great Dakota ICE walleye! Guide Eric with some JUMBO winter perch! !